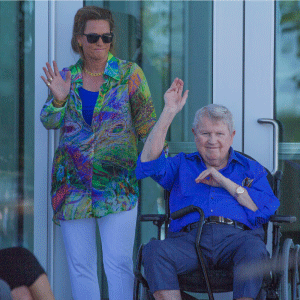 Erin and Harry Cornell during the ribbon-cutting ceremony of KCU's new campus in Joplin, MO. The first day of school was especially significant for more than 160 students in Joplin, Missouri. 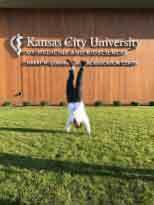 On July 24, 2017, the inaugural class of the KCU College of Osteopathic Medicine campus in Joplin began their studies. The celebration that came with their matriculation was a culmination of the work that went into the new campus. From pioneering an approach to educating first-year students to funding the construction, the Joplin campus now showcases the leadership and innovation that led to its creation – a creation that was the tireless work of many. But, the sight of students walking through the new campus's front doors would not have been possible without the support of one Joplin-region family. The fundraising campaign that helped to bring KCU to Joplin was led by Rudy Farber, chairman of Community Bank & Trust in Joplin, and Joplin-area physician Larry McIntire, DO, who serves as president of the Joplin Regional Medical School Alliance. Their work took them to Harry M. Cornell, Jr., chairman emeritus of Leggett & Platt, Inc. (L&P), a Fortune 500 company headquartered in nearby Carthage, Missouri. 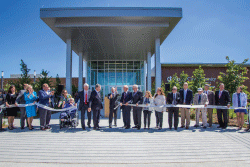 The ribbon-cutting ceremony celebrated the completion of the Kansas City University Farber-McIntire Campus. “Rudy first called me in 2015 to talk about ‘an idea’ they had for a new medical school in Joplin,” Harry recalled. At the time, Harry and his wife, Erin, were in the midst of a project at the University of Missouri to establish the Cornell Leadership Program in the Robert J. Trulaske, Sr. College of Business. 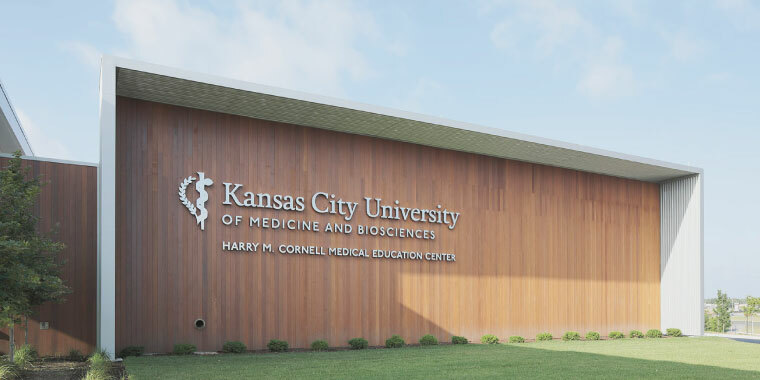 Nevertheless, the Cornells recognized the community need that Rudy had presented to them and responded to the initial request for the new KCU campus with a $1.5 million gift. It was a significant contribution to the capital campaign. Fast forward to spring 2017 when Harry and Erin revisited the plans for a medical school. They were energized by the ever-increasing passion of the fundraising committee leadership. So this time, Harry made the call to Rudy and Larry. “They were so in love with the project,” Harry said. “I have been known to ‘dream big,’ and I immediately recognized that vision and drive in Rudy and Larry.” He and Erin decided then to increase their commitment. “We want to help keep tuition low,” said Harry. With that commitment to future students in mind, the Cornells added an inspiring $8.5 million to their initial commitment, bringing their total gift to $10 million. When the Cornell’s gift – currently held in an irrevocable trust – is realized, some funds will help pay down the cost of the building, and the balance is designated for scholarships and research. Importantly, their gift will fund numerous $7,500 scholarships for first-year students. Students officially matriculated into the College of Osteopathic Medicine at the KCU Farber-McIntire Campus in Joplin this past July. One of the first stops for many of the new students, like Tanner Riscoe (above) was a photo opportunity outside of the Harry M. Cornell Medical Education Center – a campus building that the students already know will help to shape their academic career and the rest of their lives. “It is a ‘win-win’ scenario for the students, their families and the entire Joplin community for many generations to come,” said Harry. On an even larger scale, the Cornells are making a significant difference to the health of the Joplin-area community and the four-state region through their philanthropic endeavors. Two years ago, the Cornell-Beshore family gave $3 million to the Freeman Cancer Institute, now known as the Cornell-Beshore Cancer Institute. Erin is enthusiastic about the long-term impact of their gifts. “We believe the new medical school campus will have a mushroom effect on the overall health of the community,” she said. Erin predicts that as KCU-Joplin grows and the students and faculty become increasingly more involved in the community, contributing to KCU will have helped to create a stronger atmosphere of health and wellness in the region. Harry Cornell. Photo courtesy of Leggett & Platt. Circa 1970. What Harry downplays, however, is his role in shaping the community. 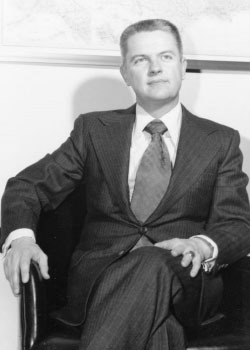 As the former CEO of L&P – a company that not only held the attention of his mind, but also his heart for nearly his entire life (Harry's grandfather J.P. Leggett co-founded the company and Harry's parents, Mack and Marjorie Cornell, served as president and director of the company respectively), Harry has been instrumental in creating an economic boom in the region. When he became CEO of L&P in 1960, the spring company had four factories generating $7 million in annual sales. In 1999, when Harry completed his tenure as CEO, the company had grown to nearly 200 factories in 18 countries and had expanded its production line from springs to a wide array of home and automobile products. L&P's annual sales the year that Harry left office? $3.5B. It is clear that while Harry's vision for L&P included expanding the company's production lines to additional regions, his vision for his personal philanthropy has remained steadfast in the Joplin/Carthage region. As such, Harry and Erin have together provided the region with a level of generosity and commitment to service that is both rare and inspiring. The Cornells, it seems, choose both.